Full text access is free in HTML pages; however the journal allows PDF access only to users from INDIA, developing countries and paid subscribers. Introduction: In postburn survivors, quality of life depends on the functional ability of one's hands. However, restoring useful function in crippled hands is a formidable challenge. Understandably in such cases, there are no standardized rules regarding the sequence of release, the type of skin cover, the duration of immobilization by K wires, and the intensity of hand therapy. Patients and Methods: We formulated a protocol and evaluated the outcome for cases of severe contractures with a total loss of hand function and distorted hand architecture. It is a cross-sectional study of 10 consecutive patients and 14 hands operated in our department from January 2014 to June 2017. The patients were operated in two stages. At the first stage, contractures of the wrist, dorsum, and thumb web space were released. Extension contractures of the fingers and thumb were also released. During the second stage, the contractures of the palm, volar aspect of the fingers, and web spaces were released. In both the stages, the fingers were maintained in released position for 3 weeks by K wires and the raw areas were covered with split skin graft/skin flap. Results: Patients were assessed for the improvement of hand function by the disabilities of the arm, shoulder and hand (DASH) scores of the 10 patients operated, four returned to the original employment/school. Four found meaningful employment. Conclusion: The aim in crippled hands is to restore useful function in the least number of stages rather than improving the range of movement in individual joints. Maintaining the release achieved by surgery with K wires, coupled with aggressive therapy, prevent the recurrence of the contractures. Introduction: The role of autologous fat grafting in burn wound healing was not studied adequately although there are few references in favor of the same. Autologous fat grafting was used in the treatment of burn wounds showing no signs of healing even after 3 weeks of injury. This study was done to study the role of autologous fat grafts in the treatment of burn wounds and to assess outcome in terms of healing or production of granulations suitable for skin grafting. 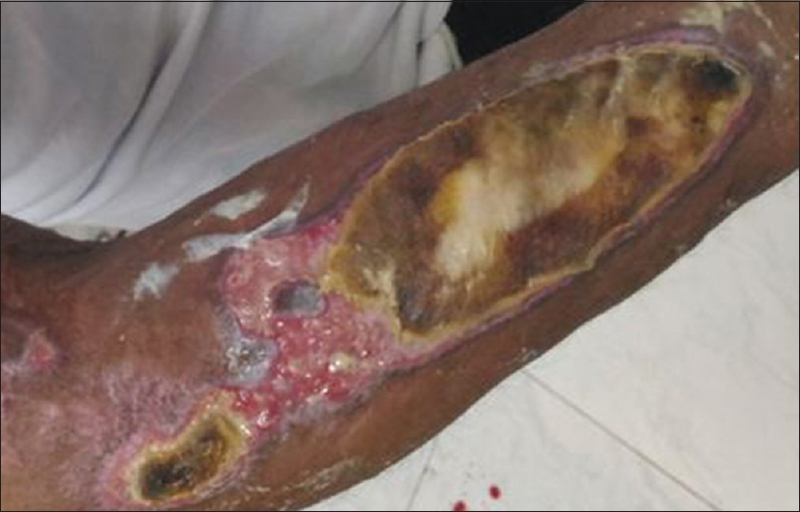 Materials and Methods: The study was conducted in a tertiary burn care center. It was a prospective case–control study. The study was done on 30 cases and 30 controls. 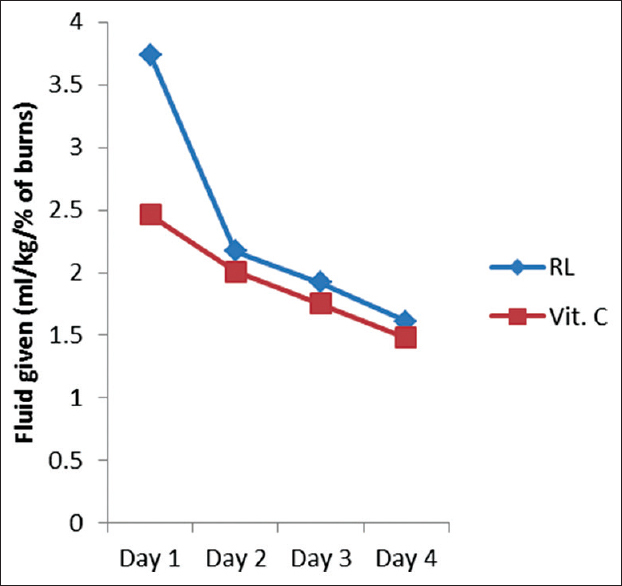 Burn wounds of duration >21 days with size <40 cm2 were selected for the study. 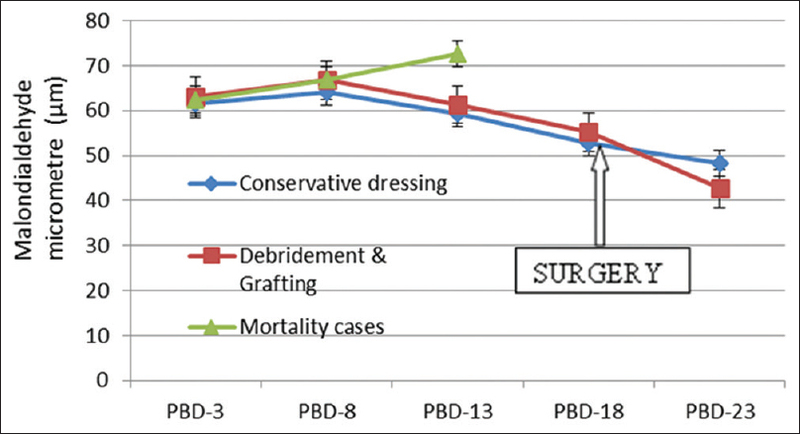 The study group underwent wound debridement followed by autologous fat grafting, whereas controls underwent wound debridement only. The results were assessed on day 3, 6, 10, and 14. Chi-squared test was used; P < 0.05 was statistically significant. Results: Statistically significant differences were noted in the early appearance of healthy granulation tissue, epithelialization from margins, and reduction in size of the wounds, leading to early healing. All patients in the study group developed healthy granulations by day 3, whereas only 6.7% of the control group developed healthy granulations. All the cases among the study group showed epithelisation from margins on day 6, whereas only 3.3% of the controls showed epithelialization from margins. On day 14, 10% of cases in the study group were healed with statistically significant reduction in size of the wounds compared to those on the control group. Discussion: The cases undergoing autologous fat grafting showed significantly improved healing with respect to faster appearance of healthy granulations, epithelialization from margins, and thereby reduction of wound surface area and healing, proving the usefulness of autologous fat grafting in burn wounds. The autologous nature of fat grafts is remarkable considering the solution to the longing problem found inside the body itself. Introduction: Exfoliative skin diseases in children can mimic burns in many ways and require early diagnosis and management. Here we enumerate the different skin conditions with four case based examples and their management. Clinical Presentation: Varying degrees of skin involvement may be seen with severe involvement in DRESS syndrome and milder involvement in Stevens-Johnson syndrome. Management: The management of this exfoliative lesion is the application of collagen membrane to the wound as we treat burns. Although systemic symptoms can produce mortality (e.g., dress), collagen dressing heals the wound well with good epithelialization. Early and appropriate antibiotic therapy is mandatory. Conclusion: Careful attention to correct diagnosis, early intervention and use of collagen dressing have improved outcome in these children. Introduction: Burn injuries are physically and psychologically devastating types of trauma and are common among children especially in the home environment. They are more prevalent and are a public health problem in developing countries principally because of poor socioeconomic conditions. Effective prevention programs should be tailored for specific geographic locations and guided by the results of well-designed studies aimed at investigating local risk factors for burns. Studies targeting households can result in the identification of risk factors operating within family setups. Study Objective: To determine the association between occurrence of burn injury and family history of burns among patients hospitalized at a large hospital in a developing country in Africa. 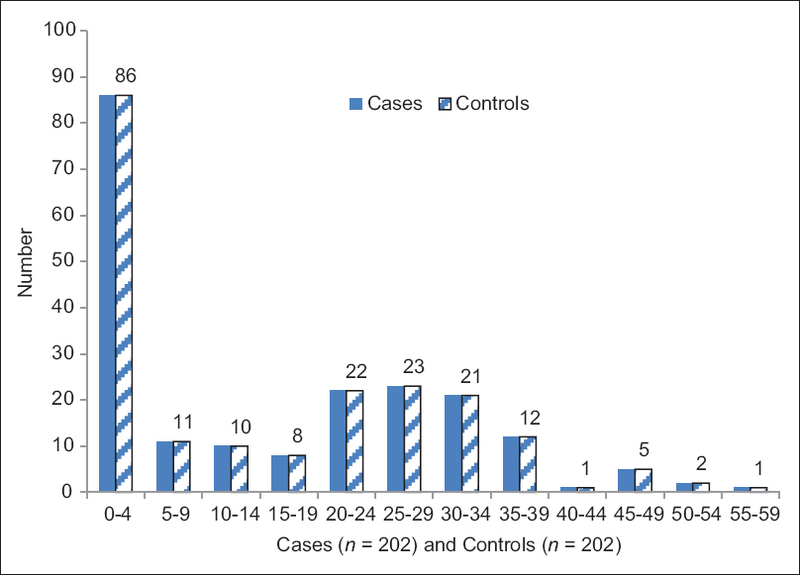 Methodology: This was age- and gender-matched case–control study comprising 202 patients admitted with burns (cases) and 202 nonsurgical patients (controls) admitted into the pediatric and medical wards. The study site was Kenyatta National Hospital, an 1800-bed national referral and teaching hospital in Kenya. The dependent variable was burn injury whereas the independent variables were family history of burn injury, history of hospitalization, and presence of a burn injury scar in the burnt family member. 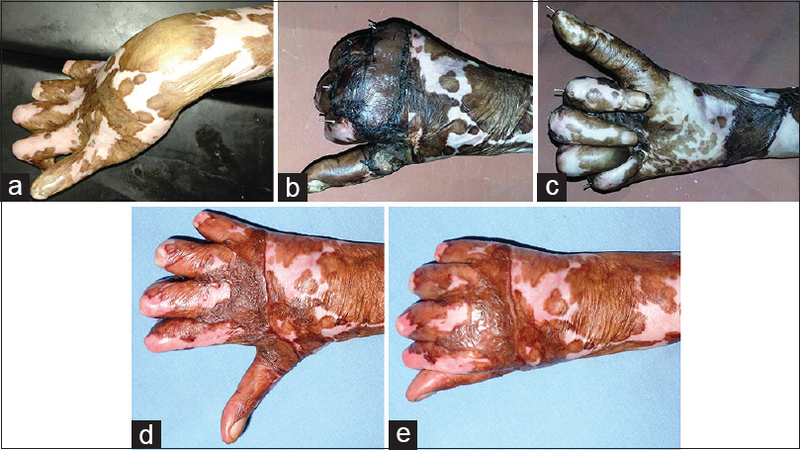 History of hospitalization following burn injury was termed as an indicator of severe burn injury having been sustained. Data Analytical Methods: The Chi-square test was used to identify the differences between the cases and control group variables, and logistic regression analysis and odds ratio were done to determine the relationship between the dependent and independent variables. Results: The male:female ratio was found to be 1:1, and burn injuries were found to be most common in the 0–4 years age bracket (n = 86, 42.6%), with the second most common age bracket being 20–40 years (n = 78, 38.6%). The injuries were mainly sustained in homes (n = 161, 80.9%) and the remainder at work (n = 15, 7.5%) and other places (n = 23, 11.6%). There was no significant difference between the two groups with regard to family history of burns (odds ratio [OR] = 0.689, 95% confidence interval [CI]: 0.443–1.073, P = 0.062) and presence of a burn scar in previously burnt family members (OR = 1.083, 95% CI: 0.308–3.805, P = 1.0). There was, however, a statistically significant higher incidence of postburn injury hospitalizations among the cases than the controls (OR = 2.354, 95% CI: 1.064–5.208, P = 0.033). Conclusion: Family history of burn injury with hospitalization of those affected is an indicator of households at a higher risk for burn injuries. More of the cases had history of hospitalization for burn injury among their family members, indicating that they had more risk factors operating within their environment, or their practices made them more prone to burn injuries. Identification of the specific risk factors involved is key in the prevention of burn injuries in homes. Background: The use of topical chemotherapy is fundamental to prevent infections thereby reducing local inflammation, pain and early healing in superficial, and deep dermal burns. Among the whole gamut, choice of topical agents became an important decisive factor. Silver sulfadiazine (SSD) cream has been an important part of burns management for many years. The major complications attributed to silver compounds are due to the complex or anion sulfadiazine, not the silver itself. With better understanding of the physical and chemical properties, nanocrystalline silver particles have emerged as the most studied material for burn wound dressing recently. 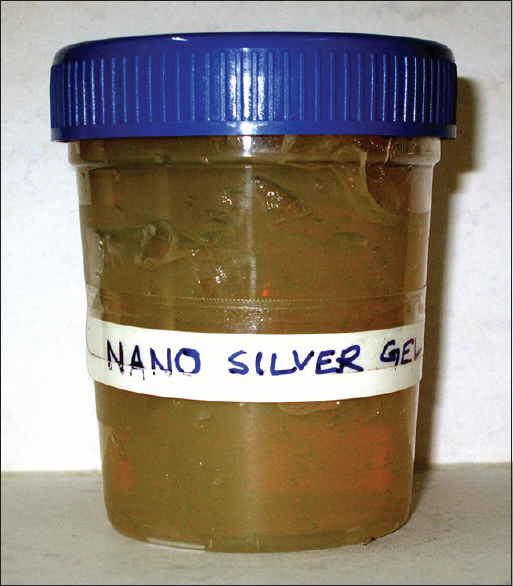 Having in mind the difficulties experienced, the aim of the present study is to compare SSD with nanosilver (nano-Ag) gel dressing to treat second-degree burn wounds. Materials and Methods: Over a period of 24 months, a total of 90 cases were studied. 45 patients randomly included in each group, further divided into two subgroups depending on depth (superficial and deep) and involvement of total body surface area (10%–20% and >20%–30%) to minimize bias. Clinical, microbiological, and histological parameters were analyzed. Results: In NS group, significantly less pain observed throughout the study period in both superficial and deep dermal burn patient. Pseudomonas was the predominant flora. Nano-Ag gel was effective in controlling most of the microorganisms except Klebsiella and Proteus sp. Healthy granulation tissue appeared faster (P = 0.0009) in deep dermal burns in nano-Ag group and confirmed histologically. Overall wound healing was more satisfactory in nano-Ag group for both superficial and deep dermal wounds, clinically as well as by histological examination. Conclusions: Clinical and histological studies showed that nano-Ag gel has a positive impact on overall healing process of the patients and proved more beneficial for the management of partial thickness burn as compared to SSD. Introduction: Thermal burns could prove dreadful to humankind. The morbidity and mortality is the interplay of intraneous and extraneous factors. Multidisciplinary approach plays a cardinal role in managing this catastrophe. This study is carried out to analyze the oxidative stress in thermal burns, its implications in management, and the significance it carries with it. Materials and Methods: This prospective study was carried out in 30 patients from January 2016 to December 2016. Quantitative analysis of oxidative stress and total antioxidant capacity was done on postburn day 3 and every 5 days thereafter. Results: The quantitative oxidative stress level was high, and antioxidant capacity was low in patients who had higher percentage total body surface area burn and predominant deep burn with temporal analysis. The patterns were strikingly different in patients who had mortality with patients who survived. Discussion: Thermal burn releases reactive oxygen species which causes profound changes in internal and external milieu. This alters the physiological response to treatment and impresses on the morbidity and mortality of the patient. Conclusion: Thereby, it could be construed that oxidative stress along with tailored intervention, timing of treatment, and recalcitrant attitude to treatment methodology has a significant role in determining the outcome of burn patients. Objective: The objective of the study is to assess the relationship between expedited burn surgery evaluation and total length of stay (LOS) in the emergency department (ED) in a high-volume tertiary burn care institution and extrapolate these results to the efficiency and cost-effectiveness of patient care. Methods: A retrospective review was performed of all patients evaluated by the burn surgery team and discharged from the University of Rochester Medical Center ED between November 2012 and June 2013. One hundred and three primary patients were identified and their time from arrival to discharge and the timing of burn surgery consultation were analyzed. Patients were stratified into two groups, early and late, based on how soon after arrival they were seen by the burn surgery service. Tests of statistical significance were performed, comparing total time in the ED, time to evaluation by ED provider, and time to evaluation by the burn surgery service. Results: Burn surgery was consulted and evaluated the early group significantly sooner than the late group (early mean: 63 min, late mean: 191 min; P < 0.001). Total ED stay (arrival-to-discharge time) was significantly lower for the early burn evaluation group (early mean: 181 min, late mean: 285 min; P < 0.001). Conclusions: Early burn surgery consultation is associated with a significantly reduced total ED LOS, arguing for immediate burn surgery consultation irrespective of ED provider contact so that patient throughput can be increased. Furthermore, the reduced LOS may translate into higher patient satisfaction, improved patient care, and lower opportunity cost of ED space. Introduction: In severe burns, there is a profound systemic response that persists till the wounds heal. Since these physiological and metabolic derangements are dynamic over the clinical course of burns, it is expected that both trend of change and absolute values of the protein and lipid levels, to have a bearing on the prognosis and the ultimate outcome. Hence, this study was envisaged evaluate the prognostic value of these metabolic variables in burn patients. Materials and Methods: The study conducted on 100 adult patients of thermal burn (20% and 60% total body surface area). Serum albumin, globulin, total proteins, cholesterol and triglycerides (TGs) were estimated on alternate days starting from day till discharge or death. The 1st-day value and the trend of serial values throughout the clinical course were compared among nonsurvivors and survivors. Results: Mean serum values of albumin, globulin, and total protein on first-day of burns in survivor group were higher. Serum albumin levels of ≤2.1 g/dl at day one was a poor prognostic factor. 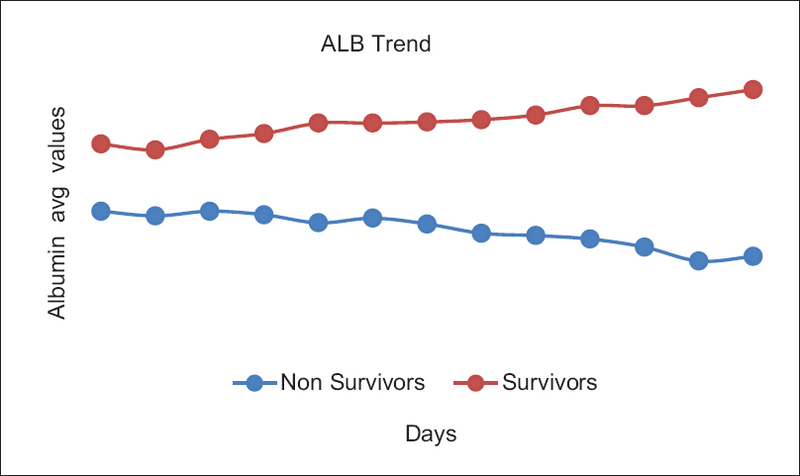 The trend in the serum values of albumin, globulin, total protein, and cholesterol in survivor group was significantly positive and negative in nonsurvivors. Serum TGs, however, showed a nonsignificant negative trend in the survivors. Among the biochemical markers evaluated, most significant prognostic parameter was serum albumin, with maximum sensitivity and specificity. Conclusion: The cutoff values of proteins and trend of subsequent serial values can guide metabolic manipulations, albumin infusion, and dietary intake. In addition, these biochemical parameters merit inclusion in burn prognostic index scales. Objective: The objective of this study was to validate if the Supreme Court order on banning the sale of firecracker in Delhi-NCR during Diwali of 2017 had any significant effect on the public behavior. 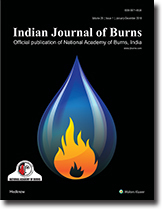 Aim: The aim of this study was to compare the demographics of patients presenting with cracker burn injuries to the burns casualty during Diwali of 2017 (1 day before Diwali, Diwali day, and the day after Diwali) to that of the previous 3 years, i.e., 2014–2016. 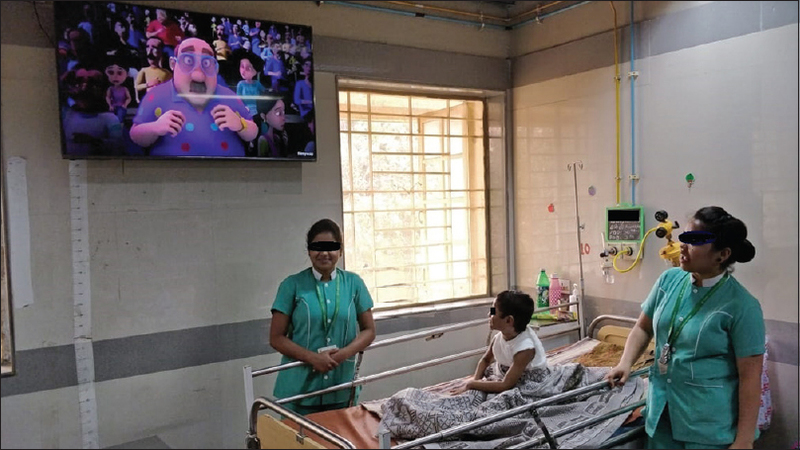 Materials and Methods: Hospital-based retrospective study was conducted in the Department of Burns and Plastic Surgery of a tertiary care center in Delhi. Result: Cracker burn injury cases during Diwali of 2017 reduced by 63% compared to the previous year. The total number of cracker burn patients presenting to the casualty on the 3 days of the festival per 100,000 populations in Delhi during Diwali was 1.56, 1.11, 1.17, and 0.42 in 2014, 2015, 2016, and 2017, respectively. The air pollution level during Diwali of 2017 has come down from “severe to very poor.” Conclusion: From the significant drop in the cracker burn injuries during Diwali of 2017, we can deduce that the ban on the sale of firecrackers has impacted a change in public behavior. This change should be noted by public authorities and has to be followed up with more measures to sustain the gains derived from banning cracker sales during Diwali of 2017 into future Diwali not only in Delhi but also in other states in the country with alarming air pollution levels. Objective: The current study aimed at investigating the relationship between symptoms of posttraumatic stress disorder (PTSD) and different coping strategies. Moreover, it is also aimed at exploring the differences in symptoms of PTSD among single and married female victims. Methodology: A cross-sectional correlational research design was used. Fifty burn women, 18–45 years of age were recruited from different burn units and nongovernmental organizations of two adjacent cities. PTSD checklist (Weather, Litz, Herman, Huska and Keane, 1993) for civilians was used to assess the symptoms of PTSD, while Brief COPE Inventory (Carver, 1997) was used to measure the coping strategies of female burn victims. Results: Results indicated that there is a negative relationship between symptoms of PTSD and self-distraction, use of emotional support, use of instrumental support, venting, positive reframing planning, humor, whereas self-blame and active coping are positively associated with symptoms of PTSD (P > 0.05). Conclusion: The findings indicated that coping strategies are associated with PTSDs. Positive and adaptive coping strategies help the individuals to cope effectively with symptoms of PTSD as compare to negative/avoidant coping strategies. Moreover, it has been found that single and married burn victims experience the same level of PTSD symptoms. Limitations and suggestions are also discussed. Background: Skin allograft, used as a biological dressing, is usually rejected after 2 weeks. Epidermis contains immunogenic cells and its removal reduces antigenicity of allograft and delays its rejection. Materials and Methods: This proof of concept observational study was conducted in 50 patients of deep burns and posttraumatic wounds to evaluate the biological response of cadaveric glycerol-preserved dermis-only allograft. The epidermis was removed surgically, and the endpoints of healing or graft rejection were compared with historical controls of full-thickness allografts. Results: Dermis-only allograft take was seen in 82% patients at 20 days; in 34% patients at 4 weeks and in 16% patients at 8 weeks. Conclusion: Surgical removal of epidermis from cadaver allograft reduces its antigenicity and enables its longer survival. Introduction: Accurate assessment of burn wound depth is important because it determines the choice of treatment and prognosis. Clinical evaluation remains the most commonly used modality with its accuracy varies from 50% to 70%. 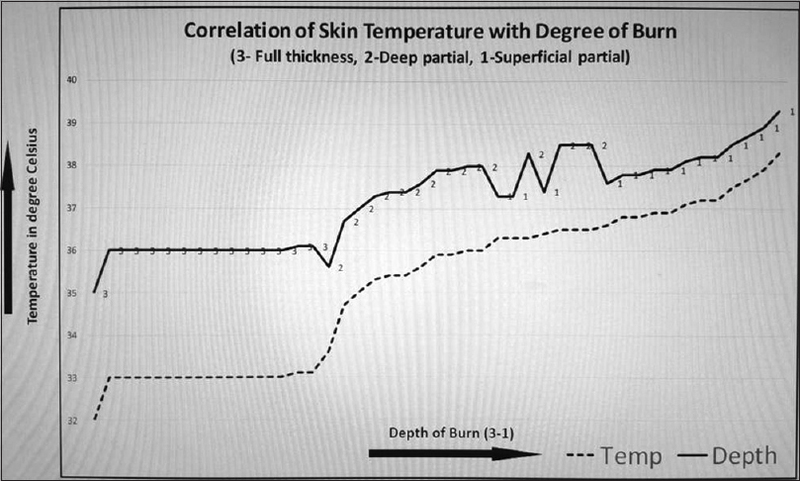 This study was conducted to assess the accuracy and feasibility of burn wound depth using noninvasive noncontact technique using infrared thermometry. 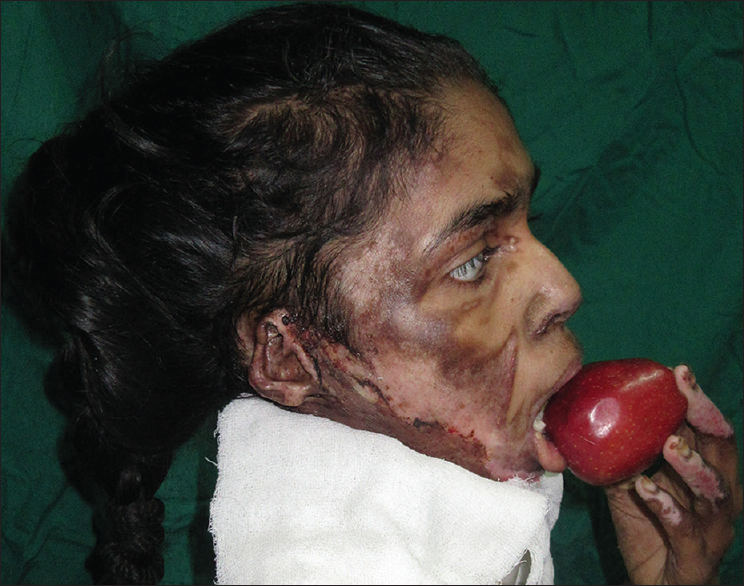 Materials and Methods: Fifteen patients' burn wounds depth was classified clinically into full-thickness, deep partial-thickness, or superficial partial-thickness burns. Thermometry was performed on 3rd day of burn injury using the handheld infrared thermometer. A punch biopsy was taken from all three areas (deep, deep-partial, and superficial-partial burns). A correlation between surface temperature and depth of burn by histopathology was done. Results: 12/15 patients total burn surface area (TBSA < 65%) survived and three patients (TBSA > 65%) died. In 11/12survivors, thermometry correctly predicted final burn depth. One of 12 burns superficial burn was wrongly assessed clinically as full thickness but was correctly classified by thermometry and healed within 21 days without surgery. 3/12 burns on clinical assessment thought to be superficial were deep; two were correctly predicted by thermometry. Conclusions: Handheld infrared thermometer can be used in conjunction with clinical examination to improve the efficacy of burn wound depth assessment. Introduction: Free radicals released after burn injury lead to vascular endothelial injury and contribute to capillary leakage which in turn leads to burn edema. Antioxidant therapy (Vitamin C), to scavenge these free radicals, is suggested to limit endothelial injury and hence limit capillary leakage which in turn leads to reduction in fluid requirement to resuscitate the burn patient. Materials and Methods: This was a prospective, randomized study of 30 burn patients with 20%–60% burns. Fifteen patients were taken in each group. Group A patients were treated with only RL and Group B were treated with RL and adjuvant Vitamin C infusion. Fluid requirement, urine output, fluid balance, body weight gain, Vitamin C, and malondialdehyde (MDA) levels were noted. The two groups were then compared. Results: Fluid requirement in Group A was 3.74 ± 0.57 ml/kg/% of burns and in Group B was 2.46 ± 0.54 ml/kg/% of burns. Urine output was 1.05 ± 0.28 ml/kg/h in Group A, and in Group B, it was 1.42 ± 0.39 ml/kg/h. Fluid retention and body weight gain were lower in Group B. MDA levels were significantly lower at 36 h in Group B. Conclusion: Vitamin C, when given as adjuvant therapy in burns, decreases fluid requirement and lowers the MDA levels showing antioxidant effect of Vitamin C.
Introduction: Acid attack in women is a burning issue in the present scenario. It is the most heinous form of violence against women. 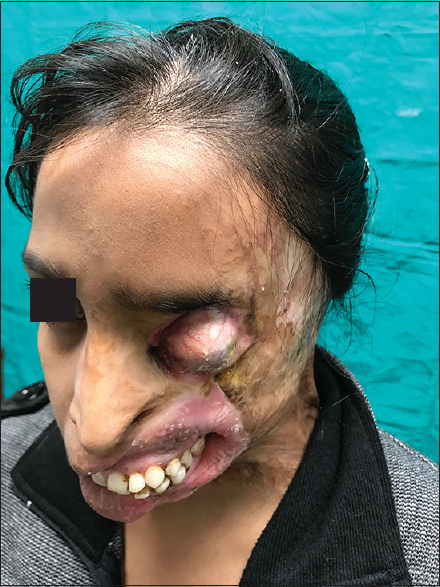 This study was designed to know the victim's profile, motives behind the acid attack, and the role of restorative treatment in improving their living standards. This study also makes people aware about the program running for acid attack survivors in Uttar Pradesh. Materials and Methods: This is a retrospective observational, analytical study of acid attack victims who were admitted to the plastic surgery department between July 2012 and June 2017 following the assault, 52 cases were included in this study period. Results: Roughly more than 50% of cases recorded were <30 years of age, while the most common age group involved was 18–28 years age group. Relationship problems were the most common reason for the attack. All cases of acid attack survivors were disfigured; 78.8% were visually impaired. Bilateral blindness occurred in eight cases. A total of 65% of the victims belong to urban areas. More than 90% of cases were suffering from more than 2% burn over the face. Surgical correction was done in all cases to improve them functionally and cosmetically as far as possible. Conclusion: In spite of several laws and schemes, a continuous increase in number of acid assault in North zone of India is a matter of serious concern. Along these laws and schemes, strategies for social upliftment against orthodox culture should also be adopted. Background: Sepsis-3 guidelines published in the Journal of American Medical Association is thought to be a pathbreaking effort in the diagnosis of sepsis,,,, but it has limitations with respect to burns population. On the other hand, the American Burn Association (ABA) 2007 guideline for sepsis in burn patients is noted for low specificity rate. However, an independent biomarker procalcitonin (PCT) could augment clinical findings and improve sepsis predictability rate in burn patients. This study is the first attempt to assess diagnostic validity of PCT in Indian population and to highlight its role in diagnosing sepsis in burns despite newer sepsis-3 guidelines. Materials and Methods: This prospective study involved 33 consecutive thermal burn patients with 66 samples estimated for PCT. Samples were sent at each suspected episode of sepsis based on ABA guidelines. 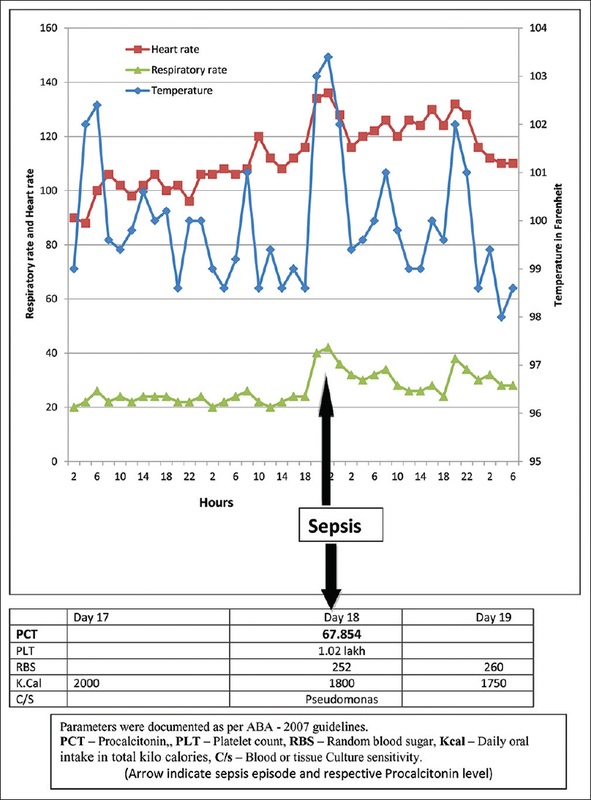 Baseline PCT estimation was done when the patient did not have sepsis. The positive blood or tissue culture was taken as a reference standard. The sample was divided into sepsis and nonsepsis group. All the parameters were documented on the graphical sheet which was interpreted by an independent analyzer. The sensitivity and specificity of each coordinate were plotted on receiver operating characteristic curve to identify the predictive ability of the test. Results: The sensitivity and specificity of the test was 94.7% and 85.7%, respectively. The cutoff value to diagnose sepsis in burn patients was 3.5 ng/ml with an area under the curve of 0.974 at 95% confidence interval. Conclusion: Good correlation between documented sepsis and elevated PCT levels makes PCT a promising biomarker in burns population. Background: Burn in the neonatal and early infancy period (<6 months of age) is a relatively rare accident, but it can cause severe problems. This study is designed to evaluate the epidemiology and etiology of burn injury in neonatal and early infancy period. Methods: In a cross-sectional study, we collected information about neonatal and early infancy burn injuries from the hospital information system in a 10-year period starting from January 1, 2007, in Imam Reza Hospital in the northeast of Iran. Data were analyzed by SPSS version 16. Results: There were 3 neonatal and 47 early infancy burn injuries (0.7% of all burn injury admissions). All injuries occurred at home. The mean age was 122.3 ± 51.7 days and 31 (62%) were males. The mean percentage of burn total body surface area (TBSA) was 19.21 ± 11.44 (range = 3–55). Mean of hospital stay was 11.9 ± 7.5 days. The fatality rate was 2%. The most common mechanisms of burn injury were scald (41, 82%) and flame (5, 10%). The most common hot liquid containers were kettle (21, 42%) and samovar (8, 16%). Explosion (28.50 ± 2.12) had caused the longest hospital stay (P = 0.01). Patients burnt by hot liquid splashed from samovar had a more burnt TBSA (30.13 ± 10.71) (P = 0.04). Conclusions: Hot beverages and food preparation simultaneous with child care are dangerous conditions which can cause burn injury in infants and neonates. The results of this study set a valuable background for running some prevention programs to prevent neonates and infants from burn injury. Full thickness burns in children often leads to eschar formation which requires escharotomy. Escarotomies in children pose various challenges depending on the site involved, age of the child, mechanism of injury etc. In this article we discuss a series of children under special circumstances who required escharotomies. We are describing the methodology used and precautions to be taken before and after surgical procedure to improve the outcome in these children. Enzymatic debridement with Nexobrid® is a recently appeared resource, which allows a selective elimination of burned tissues with one single application, becoming a new resource in the therapeutic arsenal of the burn surgeon. In this article, we expose our experience with this product, and through a representative case, we explain the management of these patients performed in our burns unit, in consonance with national and international consensus.